Bob Pellegrini nostalgically reflects on the early 1970s, and his and his father Vincent's decision to plant a vineyard on Olivet Road in the Russian River Valley, and says, “I was just naive enough at the time to think it would work, but if I knew then what I know today, I would never have done it.” Ignorance can turn out to be bliss and today wine lovers are the grateful beneficiaries of the Pellegrinis' fortuitous decision. Today the Pellegrini family farms one of the Russian River Valley’s most cherished heritage plantings, the Olive Lane Vineyard. Olivet Road is a 3-mile country stretch located in the heart of the Russian River Valley between River Road and Guerneville Road in Santa Rosa. The sloping bench land here is part of the Santa Rosa Plain. The Russian River Winegrowers Association has described three sub-appellations of the Russian River Valley: the Middle Reach (not precisely defined but includes the vineyards on a seven-mile stretch of Westside Road from just west of Healdsburg to the Wohler Bridge), the Santa Rosa Plain and Laguna Ridges, and Green Valley. The Santa Rosa Plain is a cool region, sandwiched between the warmer Middle Reach and downright chilly Green Valley. 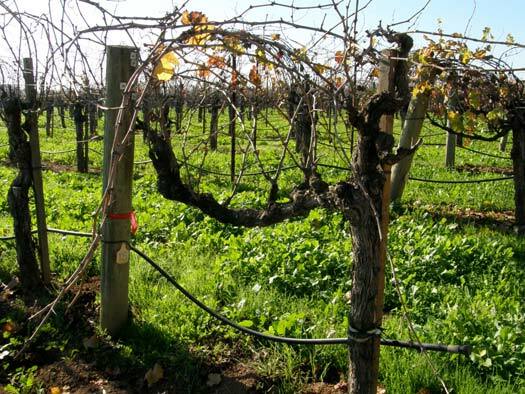 The Santa Rosa Plain’s combination of soil and climate is particularly suitable for cool climate varieties such as Pinot Noir and Chardonnay. 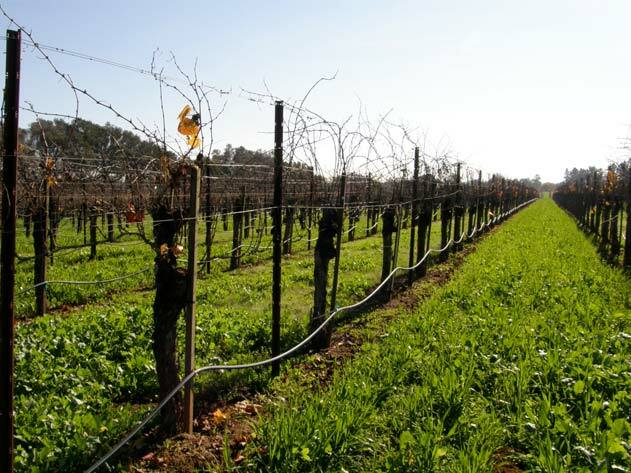 The area features a region I climate with frequent intrusion of fog primarily through the Petaluma Gap, warm sunny afternoons, and well-drained Yoshiki loam and clay soils. The Olivet Lane Vineyard was one of the first Pinot Noir estates in the Russian River Valley, preceded a few years by only a handful of others including the Bacigalupi Vineyard (planted on Westside Road in the Middle Reach in 1964), Rochioli Vineyard (East Block planted in 1968 on Westside Road in the Middle Reach) and Joseph Swan’s vineyard (first planted in 1969 in the Laguna Ridges and now named the Trenton Estate Vineyard). The Olivet Lane Vineyard was also uniquely planted to both Pinot Noir and Chardonnay. 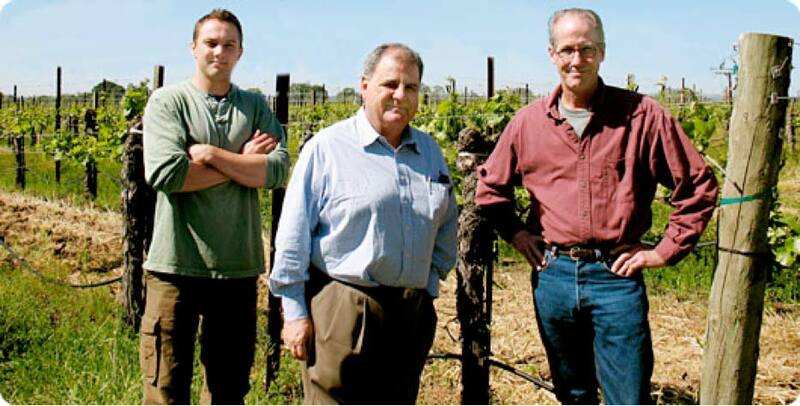 Olivet Lane Vineyard owes its heritage to the Pellegrini family, Sonoma County wine patriarchs who have been involved with wine in one way or another since the early 1900s, when brother Nello and Gino Pellegrini immigrated to New York City from their native Tuscany. They soon traveled to California and began shipping grapes for home winemaking from Sonoma County to destinations throughout the United States. They also supplied the many Italian San Franciscans who made wine in their basements both before and during Prohibition. 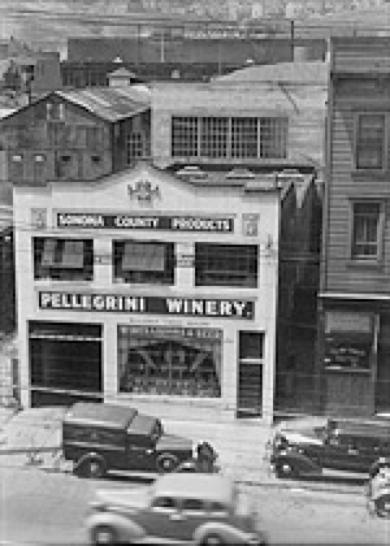 After the repeal of Prohibition in 1933, the Pellegrini family started the Pellegrini Wine Company, shipping grapes from Sonoma County and making wines for San Francisco’s best restaurants. Later, the family became wholesale distributors of both imported and domestic wines. In 1973, Nello’s son, Vincent, approached Paul Mononi about buying his 65-acre prune, apple and olive orchard on a spur off of Olivet Road named West Olivet Lane. Paul Mononi had grown up on the property his father had acquired in 1955. The fruit trees were originally patterned after Luther Burbank’s design according to the climate and soil. As a youngster, Paul farmed a small plot of Zinfandel grapes on the family’s land and recalls selling the grapes in 1954 for $1 a box. Paul took over management of the fruit at the tender age of 21 after his father’s death but the challenges of farming the fruit orchard proved overwhelming and Paul was amendable to selling the property. Paul sold the property to Vincent and in turn agreed to plant a vineyard. Vincent’s son, Bob, was fresh out of school, had just returned from a tour of Burgundy and along with Vincent, was intrigued by the idea of planting Pinot Noir on the newly acquired land. At the recommendation of Dr. A.N. Kasimatis of University California Davis, both Pinot Noir and Chardonnay were planted. Economic considerations came into play in the decision to plant both varieties as well, as Chardonnay was much more in demand than Pinot Noir which was only bringing $325 a ton at the time. Planting started in 1975, a time when Pinot Noir vines were difficult to source. As Paul recalls, “Clones were not of any importance, you had to beg for vines, and you had no positive assurance that you were receiving Pinot Noir clones.” The vineyard was planted to what is now called the Martini clone. According to John Haeger (North American Pinot Noir), the Martini clones (UCD 13, 15, 66) were derived from the Carneros Stanly ranch plantings of Louis M. Martini and Harold Olmo. Reputedly, the budwood for these vines came from a block of vines situated in the front of the old Inglenook Winery on Highway 29 in Rutherford which date back to the 1930s or earlier. Some may have come from a University of California Berkeley experimental vineyard as well. During the 1970s, 1980s and into the 1990s, many vineyards were planted in California using field selections from Carneros vineyards as well as specific UCD 13, 15 and 66 clones. 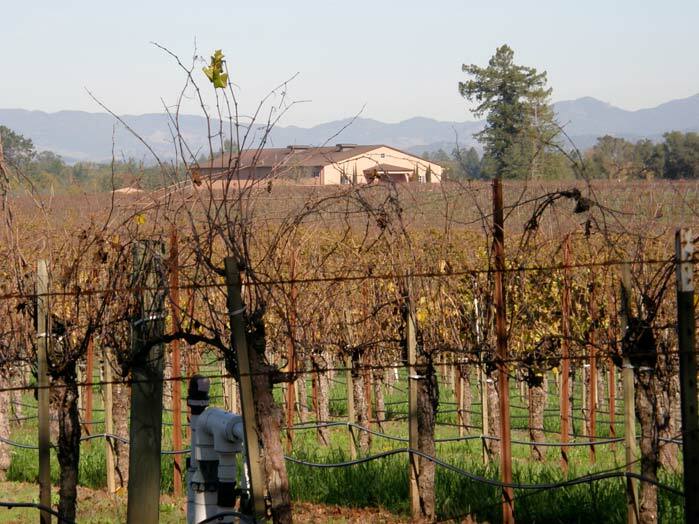 Clones 13 and 15 were the most widely planted during the 1970s and most likely found a home at Olivet Lane Vineyard as well. The 33 year-old vineyard is essentially a monoblock of Martini clone planted on AXR rootstock with wide vine spacing that was in favor in the 1970s (see photo below). The soil is relatively consistent throughout the vineyard. Because of the AXR rootstock, the Olivet Lane Vineyard is living on borrowed time and already some blocks have shown decline as indicated by reduced yields. Until recently, weak vines were replaced vine-by- vine using budwood from the vineyard. Soon, a few larger 2 to 3 acre portions will be incrementally replanted using the Martini clone budwood from the vineyard to retain the vineyard’s unique character. Currently the vineyard is planted to two-thirds Chardonnay and one-third Pinot Noir. Olivet Lane Estate and Pellegrini Family Vineyards winemaker Kevin Hamel talked to me about the distinctiveness of the Olivet Lane Vineyard. He said that Pellegrini Family Winery also makes Pinot Noir for neighbors who are adjacent the Olivet Lane Vineyard. These vineyards are planted to Dijon and Pommard clones on resistant rootstock in the same soil as Olivet Lane but the Pinot Noir produced from them is distinctly different from the Olivet Lane Estate Pinot Noir. Where the Olivet Lane Vineyard Pinot Noir is unique for its red fruit, fragrance and subtle spice and floral notes, the neighbor’s Pinot Noir is broader with more brown aromatics and spice. There is clearly something special about the combination of soil, rootstock and clone at Olivet Lane Vineyard. Recently trials have been ongoing comparing natural yeast with inoculated yeast fermentations for both the vineyard’s Chardonnay and Pinot Noir. The lots undergoing indigenous fermentation show more complexity and interest. At a recent Pinot Forum, (a technical tasting for sommeliers held during the summer in Sonoma County), attendees who critically compared both the native and inoculated yeast fermented Olivet Lane Vineyard wines, largely preferred the native fermented wines. Four to five barrels of a reserve Olivet Lane Estate Pinot Noir will be produced from the 2006 vintage for the first time, largely or completely composed of native fermented lots which have undergone additional barrel aging. When I visited recently, I was able to sample both the native and proprietary yeast fermented 2007 Pinot Noirs from barrel and the native fermented wine was clearly more nuanced and interesting. 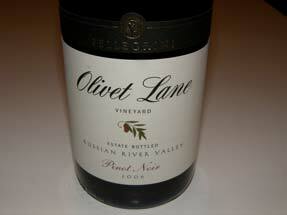 All future vintages of Olivet Lane Estate Pinot Noir may be produced with indigenous fermentation when possible. The Pellegrinis started releasing an Olivet Lane Estate Chardonnay in the late 1970s and an Olivet Lane Pinot Noir in the 1980s. Merry Edwards (who at one time made the wines at Olivet Lane) and Williams Selyem were two of the most notable producers buying fruit from the Olivet Lane Vineyard. Beginning in 1988, Williams Selyem received half of the grapes from the vineyard and their stellar vineyard-designate bottlings brought considerable notoriety to Olivet Lane Vineyard. Vertical shoot positioning and a leaf pulling program were begun after the 1989 harvest, both instituted to provide more concentrated color and flavors in the resultant wines. 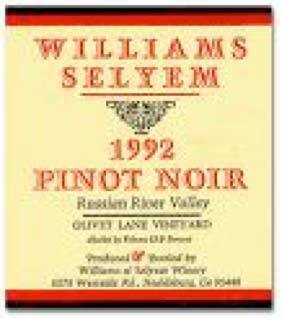 The 1991 and 1992 Williams Selyem Olivet Lane Vineyard Pinot Noirs were highly lauded by the Wine Spectator, Robert Parker (he called the 1991 Olivet Lane Vineyard Pinot Noir a “reference wine”), and the Underground Wine Journal. The last vintage for Williams Selyem Olivet Lane Estate coincided with the sale of the winery in 1997. Merry Edwards released her first Olivet Lane Vineyard Pinot Noir in 1999 from the 1997 vintage and continues to release an annual vineyard-designate Pinot Noir from the vineyard. Through the years, other customers for Olivet Lane grapes have included WesMar (2000 to 2005), Gary Farrell, Brogan Cellars (2000), Kosta Browne, and most recently Paul Hobbs. Today, most of the fruit is retained for the Olivet Lane Estate Pinot Noir and production is 2,500 to 3,000 cases annually. A Tuscan-styled winery was built on the estate in 2001 which includes a tasting room that is open daily by appointment. The address is 4055 West Olivet Road in Santa Rosa. 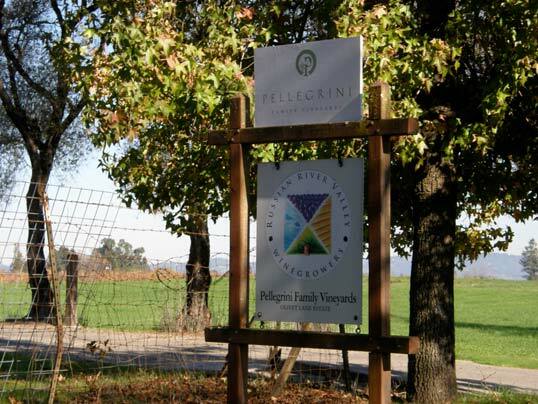 Olivet Lane Estate wines are available on the website at www.pellegrinisonoma.com. The phone is 800-891-0244. Besides the Olivet Lane label, Pellegrini Family Vineyards releases multiple varieties under the Pellegrini and Cloverdale Ranch labels. 14.1% alc., $36. · Bright crimson robe. Pleasing aromas of red Pinot fruits, especially Bing cherry, oak spice and vanilla. Cherry driven juicy flavors pushing ripeness to the edge with a hint of raisin and roasted fruit. Easy to drink with fine-grained tannins and a refreshingly clean finish. 14.3% alc., $57. · Classic and classy Russian River Valley Pinot Noir profile featuring the triad of Bing cherries, cola and Asian spice. Restrained and demure, yet immensely satisfying with gossamer tannins and impeccable balance. This one hits all the right notes. 14.3% alc., $60. · Deep ruby color. Nicely oaked, rich black cherry fruit highlighted with vanillin and spice, finishing with good persistence and leaving quite a bit of tannin in its wake. 14.3% alc., 185 cases, $35. · Intoxicating old wine bouquet featuring black raspberries, raisin, marzipan and lacquered wood. Roasted berries and raisin carry through on the palate with notes of brown sugar. Silky in texture with some unobtrusive tannin and a good acid spark on the finish. Charming and still pretty darn good, but should be drunk now. 14.3% alc., 162 cases, $35. · Intense perfume of cherry liquor with hints of oak, spice and smoke. Plush and generous on the palate but falls short of jammy, featuring dark cherry flavors, hints of cola and Asian spice, restrained tannins and a velvety texture. This wine has surrendered none of its fruit strength and complexity over time and has several good years ahead. A seductive wine of great charm. 14.4%., 177 cases, $37. · Evocative Bing cherry and raspberry fruit with a sidecar of cardamon and cinnamon spice. Hi-toned and vivid with lively acidity and supple tannins. Light on its feet and impeccably balanced, this wine leaves a long, scented raspberry aroma on the finish. A little less fruit extraction than the 2003 vintage, but equally satisfying. 14.0% alc., 308 cases, $37. The final bottling from Olivet Lane for WesMar. · Dark reddish-purple color. Complex aromatic profile of dark red cherries, berries, baking spice, herbs, oak char and barnyard. Tasty dark red stone fruits with a burly, earthy edge. Nicely composed and balanced with mild ripe tannins and a citrus peel tang on the lively finish. Not the fruit intensity of the previous vintages and more in touch with the Olivet Lane Estate bottlings by Pellegrini. Kenneth Juhasz (YOU haas) and his wife and partner Laura have fashioned a cult label concentrating on Pinot Noir and Chardonnay. Growing up in North Carolina, Juhasz worked his way through college working in fine restaurants and a local wine retailer. He first developed his winemaking talents in Oregon’s Willamette Valley working with veteran winemaker Ken Bernards. He also spent time in the Central Otago region of New Zealand’s South Island helping to launch Hinton Estate. In 2002 he settled in Carneros as the winemaker for both the Robert Stemmler label and The Donum Estate. 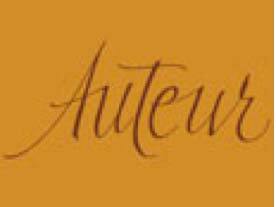 The word Auteur is the French translation for author and composer. The orange color of the label reflects the adventurous spirit of the Juhaszs and the organic nature of their winemaking. The focus of Auteur is on cool microclimates in Oregon and California and vineyard-designate wines. Juhasz’s winemaking philosophy is “to maintain the dualism between the varietals’ masculine and feminine character.” Grapes are currently sourced from the Willamette Valley (Hyland Vineyard and Shea Vineyard), Sonoma Coast, Los Carneros and Mendocino Ridge. I tasted through four recent Auteur Pinot Noir releases and came away impressed by both of the 2006 bottlings in particular. The style will appeal those who prefer bold and intense wines packed with fruit. Despite their showy volume, they retain a modicum of elegance. 14.2% alc., 279 cases, $35. 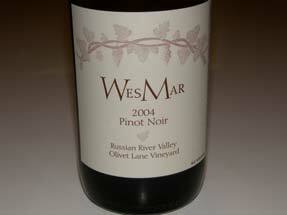 An unusual combination of Pinot Noir fruit from both Oregon (85%) and California (15%) vineyards. 30% whole cluster. · Needs time to open in the glass eventually revealing raspberry, herbs, oak toast and a feral note. Wild berry fruit flavors are at the forefront augmented by oak with a grainy texture and very nice balance. A decent but not exceptional wine. 14.4% alc., 247 cases, $60. 50% Calera and 50% Swan selections. 10% whole cluster fermentation. · Native yeast. Aged in tight grain 50% new French oak. Dark violet in color. Very ripe fruit aromatic profile showing off raisin, roasted nuts, marzipan, mature grapes and seasoned wood. A touch of alcohol peeks out on the nose. The rich dark red fruits are somewhat subdued and augmented by flavors of roasted fruit and nuts ending in a dry finish. I could not warm up to this wine. 14.3% alc., 291 cases, $45. This vineyard has some of the oldest vines in Oregon, dating to the early 1970s. The vineyard sits in the McMinnville foothills in the Van Duzer corridor. Pommard and Wädenswil clones planted in volcanic Jory and Nekia soils. 25% whole cluster, 10% saigné, native yeast fermentation, 50% new French cooperage. · Very dark reddish-purple color. Complex and enticing nose touting dark fruits, underbrush, oak toast, fresh-roast coffee, redwood and a touch of alcohol. This wine is infused with flavors of blackberries, black raspberries and plum. Rich and fruity, yet retaining admirable finesse, it shows off a slippery texture and comes together nicely for a very pleasurable drinking experience. 14.7% alc., 313 cases, $75. Grapes were harvested from the special Back Block which is allocated only to Auteur and Shea Wine Cellars. Yields were 1.75 tons per acre. 100% Wädenswil clone.11% whole cluster. Native yeast fermentation. Aged in 55% new French cooperage. · Darkly colored and darkly flavored, this beauty is awesome. Aromas of rich dark stone fruit and berries, brioche, dark chocolate and tobacco smoke are echoed on the palate. Luscious and juicy, the tannins are fine and silky and the mouth feel is all satin. A WOW! wine that demands attention. Hard to believe something this good could come from a grape. To acquire Auteur wines, join the mailing list at www.auteurwines.com or check various wine retailers including www.vinfolio.com. The winery is not open to the public. 707-696-8949. ** Harvest 2008. California had it all in 2008: winter frosts between February and April, rain at inopportune times, spring and summer heat waves, and smoke from brush fires. Yields were down by as much as 10-30% in various regions of California. Some winegrowers lucked out and others were devastated. Jonathan Pey of Pey-Marin Vineyards in Marin County said, “We saw more lignification of seeds and stems this year at my vineyards, yields were good, and the small clusters looked really, really nice. We had zero burn and raising generally in Marin. Still, a few vineyards got slaughtered with frost early on.” Smoke taint was a serious concern in Mendocino County where there were 120 fires and a number of vineyards in the Sonoma Coast were affected as well. The compounds that cause smoke taint are guaiacol and 4-ethylguaiacol which bind to sugar in the grape and are released during fermentation. The result is a fishy aroma in the wine. Filtration companies have the technology to remove smoke taint but the smaller boutique wineries often do not have the financial resources to filter significant amounts of their wine. Some of the smoke-tainted wines will need to be de-classified, while others will have such little apparent smoke taint that consumers will be unaware. With the grape shortage in 2008 and the growing demand for wine outstripping the planting of new Pinot Noir vineyards, shortages are expected to develop. In Santa Maria Valley, ripening continued gradually with near perfect conditions between July and September and the result was relatively lower acidity and higher pH in the grapes. Quality was excellent although yields were variably decreased due to the April frost and early summer heat wave (up to 109º F in Lompoc). Oregon’s growing season was relatively uneventful with a delayed bud break followed by a cool summer and harvest that extended until late October. Oregon was spared the rainfall usually prevalent in October with but a few uneventful showers early in the month. Yields were down due to bad weather during flowering, but flavor concentration and physiological maturity in the grapes turned out to be superb. Many vintners are ecstatic about the vintage, claiming it is the best harvest since 1999. 2008 was a very difficult vintage in Burgundy, marked by cold weather during flowering, an outbreak of mildew and odium during the summer and hail in selected regions such as Volnay and Marsannay. The harvest was saved by warm, dry conditions in September. The quality of red Burgundy from 2008 will vary considerably depending on the producer and the vineyard location. ** Wine consumption continues to increase in the United States, especially among the Millennial population (ages 15 to 32). Preliminary data from the Wine Market Council for 2008 indicates that 2008 will be the 15th consecutive year that wine consumption has increased. It is expected that in 2010 the United States will become the world’s largest wine market and biggest wine importer. The strongest growth has been in wines priced at more than $12. Pinot Noir is experiencing a growth rate above 20 percent. Millenials (Generation Y) have shown the greatest increase in wine consumption compared to all other generations (Generation X, Boomer, Swing and WW II). According to the 2008 Wine Handbook, the 70 million Millenials are a curious generation as shown by their propensity to experiment with different wines, showing little variety or brand loyalty. They are increasingly turning to wine as their drink of choice and buy wine based on visual appeal and name recognition rather than winemaking region. They tend to prefer wine over beer. The Baby Boomers (ages 45-63), who have more disposable income, tend to spend more on the higher-priced wines. Interestingly, the Hispanic population is becoming an important wine consumer group. In striking contrast, the French Millenial population have been drinking less wine, preferring other alcohol-based drinks and bottled sodas and juices. A series of in-depth interviews with French Millenials conducted by Sonoma State University and France’s University of Agronomics reported in winebusiness.com (Mary 7, 2008) found that the reasons young French adults are moving away from wine are the anti-alcohol movement in France, a dislike for the taste of wine, the high expense of wine, confusion about wine, and the perception that wine is an old person’s drink of choice. ** The cost of producing fine Pinot Noir continues to escalate. Land prices in California exceed almost all wine growing regions of the world and the cost of vineyard land continues to increase in Oregon as well. Due to tighter border enforcement, seasonal immigrant workers are become more scarce forcing wineries to hire workers full-time. Exchange rates are escalating barrel prices and the cost of bottles is rising. Wineries are experiencing increasing administrative costs dealing with shipping regulations, compliance issues and management of internet sales. Top-tier Pinot Noirs come from prime vineyards and grapes from these vineyards are commanding among the highest prices in the industry, upwards of $4,000 per ton in Oregon and $6,000 per ton in California. ** Wine industry is a leader in green practices. Many winegrowers are returning to farming practices that have been around hundreds of years. Sustainable farming is de rigeur now and the use of pesticides, herbicides and fertilizers is being discontinued. Newer wineries, such as Littorai in Sebastopol California, are being constructed of thick straw bales, are bermed into hillsides and incorporating caves to minimize the use of electricity for cooling in the winery. More than 80 wineries in California have solar power now, most of them located in Napa and Sonoma County. Many of these wineries, such as Frog’s Leap in Rutherford, are powered solely by solar energy. Nickel and Nickel Winery in the Napa Valley mounted their solar panels on an irrigation pond used in the vineyards, termed “floatovoltaics.” The largest solar installation in the world is to be built for Constellation Wines’ Gonzalez winery in Monterey County. Mitsubishi solar panels will cover 170,000 square feet on the winery warehouse roof, and will generate enough power to offset 50% of the winery’s needs. When the winery is operating at less than full capacity, the electricity will be exported to help power the energy needs of the surrounding residential areas. Stoller Vineyards in Dundee (pictured below), is one of Oregon’s first green wineries (and only winery in the country to be Gold LEED certified) employs solar panels on the roof of the winery. 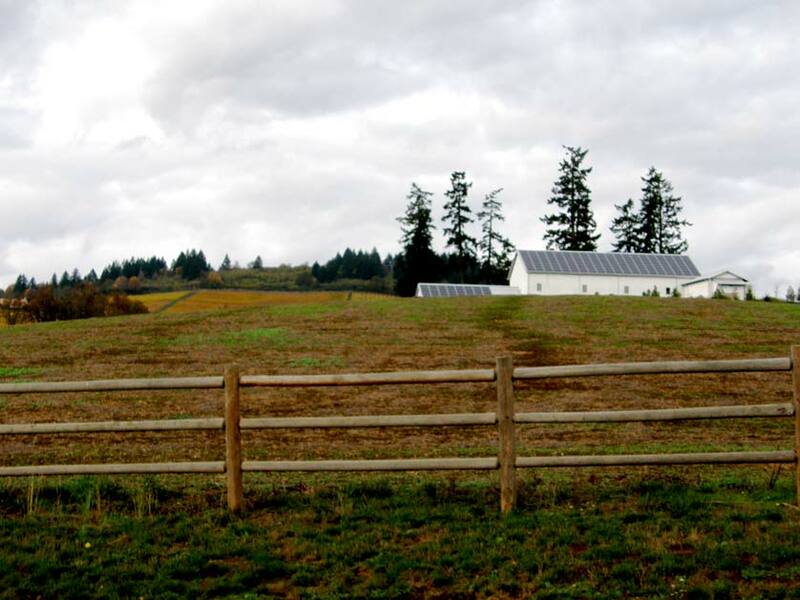 Domaine Drouhin Oregon has installed the largest solar energy system in Oregon to date. More than 500 photovoltaic panels are situated in the midst of the winery’s vineyards in the Dundee Hills. Other green practices in wineries include geothermal systems in winery offices and guest centers that eliminate the need for heating and air conditioning, gravity-flow winemaking practices and waste water reclamation to reduce negative environmental impact. Oregon continues to lead the way in sustainability practices. 26 wineries initially joined the Carbon Neutral Challenge Initiative in Oregon in 2008 and others are soon to follow. The aim is to reduce a winery’s carbon footprint and ultimately reach carbon neutrality. ** New wine packaging. Shipping glass bottles is expensive and inefficient and environmentally unfriendly. Many wineries, primarily producers of lower-priced varieties, are looking at alternatives to wine bottles. These include packaging wine in a box (a bag-in-box or BIB) which debuted in 2003 but is receiving increasing interest. The cardboard box is recyclable and due to its larger size (most boxes contain 4 bottles of wine), is more efficiently packaged and shipped. Glass alternatives include polyethylene terephthalate (PET) bottles which are lighter in weight than glass bottles, are easier to recycle and transport and won’t break if dropped. Although consumers perceive wine bottled in plastic as cheap, a study reported in Wine Business Monthly (August 2008) indicated that if the consumers were allowed to examine the plastic bottles and were shown the advantages of plastic compared to glass, 47 percent said they would be extremely or very likely to buy wine in a plastic bottle. Plastic bottles are now available with an internal silicon oxide barrier coating that protects the wine from taint and can be removed during the PET recycling process. Burgundy producer Jean-Charles Boisset has been a proponent of PET bottles and has released his Yellow Jersey Vin de Pays d’Or wines in plastic bottles. Still other alternative wine packages include Tetra Paks, another box container, and aluminum bottles that are recyclable. Although heavy weighted bottles with large punts and unusual shapes add perceived value to high-end wines, consumers are increasingly finding them excessive and undesirable for environmental reasons. I personally urge producers to discontinue these bottles because they don’t fit into standard wine racks, are cumbersome to lift and travel with, and simply are a waste of energy and resources. About the only thing they signify to me is that the wine inside is more expensive, not necessarily of better quality. ** Wine closure debate continues. Winemakers continue to be split about whether it is important to have oxygen ingress through or around a closure after bottling. 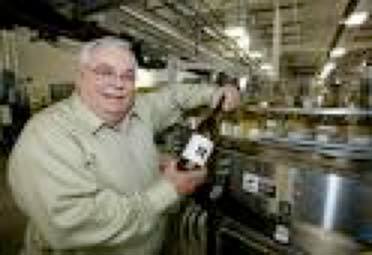 In a two-part series written by Richard Grant Peterson, PhD, for Appellation America (www.appellationamerica.com) in 2008, Peterson pleas to wine writers and cork promoters to cease telling people that cork’s “breathe.” He points out that no air passes through corks into wine after bottling. Rather, oxygen diffuses out of corks (which are composed of 80 percent air) into the wine initially due to the high pressure in cork cells immediately after bottling. Any oxygen ingress into a bottle of wine comes by way of the interface between the cork and the glass. He believes sound corks are the preferred closure for fine wines. He also concedes that screw caps “are OK, provided the liner seals well and continue to keep the air completely out for a long enough time.” My personal observations over the past year in sampling hundreds of wines, primarily from California and Oregon, is that the incidence of cork taint has been definitely reduced to less than 2 percent. The attention on alternative closures has forced cork producers to clean up their act so to speak. Cork continues to provide the advantage of leaving a much smaller carbon imprint than synthetic corks and screw caps. Although there are some producers fully committed to screw caps (Loring Wine Company in California and Argyle Winery in Oregon, for example), I have seen no recent trend among high-end Pinot Noir producers to beat a path to alternative closures except in their lowest end bottlings or white wines. The producer of the Stelvin screw cap reported that in 2007, the overall screw cap market grew 24% in the United States. Jamie Goode, PhD, reported in Wines & Vines (August 2008), that “designer closures” with variable oxygen transmission rates are being developed that allow winemakers to choose the type of closure to match the particular wine they are producing. Research is ongoing to determine how much oxygen transmission, if any, is desirable in certain types of wine, and how much oxygen existing closures transmit.” The problem with synthetic corks (Nomacorc, neocork, Supremecorq and NuKorc) has been excessive oxygen transmission resulting in wines having signs of oxidation after a short time in the bottle. Synthetic closures seem to be best adapted to wines made for early consumption where aging is not an issue. DIAM holds great promise as a wine closure. Produced in Australia, DIAM consists of small granules of cork with synthetic microspheres and is an in-neck closure that performs very similarly to natural cork but with no TCA problems. The washing process on DIAM closures removes any possibility of cork taint. Different DIAM closures allow varying amounts of oxygen transmission. I have come across a few bottlings of Pinot Noir sealed with Vino-Seal, a glass and polymer closure made by Alcoa and known in Europe as Vino-Lok. It consists of a glass stopper with and “O” ring around its base to provide a seal. The glass stopper is held in place by an aluminum cap. Oxygen transmission is said to be similar to a tin-lined screw cap. The glass closure has become popular in Germany, Austria and Italy. ZORK is a tamper resistant polymer closure developed in Australia that combines an in-neck component with a screw cap type lining that hugs the rim of the bottle. The wines of Don Sebastiani and Sons, which only uses alternative closures, are closed with the distinctive and colorful ZORK. ZORK is developing a version for sparkling wines that has the advantages of being able to reseal a sparkling wine bottle and doesn’t rocket out of the bottle when the bottle is opened. (L to R, Diam, Vino-Seal, Zork). ** More wine is being sold directly via e-commerce both directly through winery websites and through third party sites. On-line retailer VinoShipper.com provides boutique wineries a portal for selling their wines and VinoShipper.com handles all the compliance and tax details associated with shipping. This relieves small wineries from the administrative headaches of dealing with individual states’ shipping regulations. Over 350 wines are now available, including several from small Pinot Noir producers such as Inman Family Wines, De La Montanya, Kendric Vineyards, Bohemian Vineyards, Dutton-Goldfield Winery, Kastania Vineyards and TR Elliott in California and Artisanal Wine Cellars, Laura Volkman Vineyards, Amelie Robert Estate, Et Fille Wines, Barking Frog Winery and Longplay in Oregon. VinoShipper.com retains 15 percent of the final sale price and offers price breaks to states where a winery’s wines are not currently shipped. Visit www.vinoshipper.com. ** Utilizing Pinot Noir’s genome map. In 2007, French and Italian researchers determined the sequence of the almost 30,000 genes found in Pinot Noir in 19 pairs of chromosomes. Researchers in the International Grape Genome Program are now decoding that sequence. Geneticists and plant biochemists worldwide are looking to use this information to increase a grapevine’s resistance to pests and disease, make a grapevine more resistant to drought, and improve flavor and aroma profiles of grapes. ** Dry farming has attracted renewed interest. The dwindling water supplies in California in particular combined with the belief of some that dry farmed vineyards produce more intense flavors in wine, have led winegrowers to examine ways to retain more moisture in the ground without irrigating. Dry farming is prevalent in countries such as Spain and France where it is illegal to irrigate in some regions, but irrigation is almost universally employed in California where the warm climate and limited rainfall make it a necessity. Fortunately grapevines are extremely hardy and have some ability to adapt to drought since their origins date to the Middle East and Mediterranean regions. 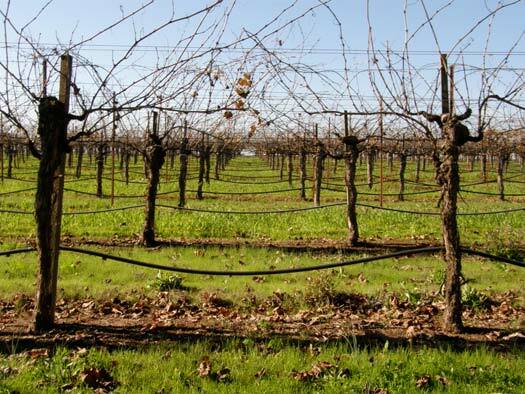 With proper cultivation, management of cover crops, mulching and the use of drought-tolerant rootstocks, dry farming is becoming more in vogue in California in locations that are blessed with soils that have good drainage yet enough moisture-holding capacity and rainfall to supply the needs of the grapevines. A trend toward establishing vineyards in cool-climate locales will be driven by the suitability of such locations to support a vineyard with minimal to no irrigation. ** TCA still requires vigilance in the winery. Although most talk about TCA centers on corks, TCA may develop in barrels, cellar pallets, cardboard boxes, wood structures and even hoses. Fortunately, wineries can periodically screen for TCA contamination using large laboratories which can test wine, corks, wood and even the atmosphere in wineries. If TCA is discovered in a wine, it can be removed using polymers that adsorb the TCA without affecting the flavors or aromas of the wine. ** Newest innovative and gentle winery equipment makes a difference. Wineries are employing many new relatively affordable winemaking “toys” to improve the quality of their wines. The newest equipment favored by Pinot Noir specialists include sorting tables, MOG (material other than grapes) removers, low-force hydraulic basket presses (right), soft and low-impact pumps, and de-stemmers that are less abrasive to grapes. Newer gentle de-stemmers are too slow for processing large tonnages of fruit but are very applicable to small production wineries specializing in Pinot Noir. Modern de-stemmers are preferred because they allow berries to remain intact. Older caged de-stemmers crushed and tore the berries apart leading to more undesirable extraction from seeds. ** Dwindling immigrant labor supply has renewed interest in machine harvesting but not for Pinot Noir grapes. According to Wines & Vines (March 2008), half of all the wine grapes in California are harvested by machine, but in premium grape growing regions such as Napa and Sonoma it is closer to 35%. The cost of machine harvesting grapes ($70 to $275 per acre) is significantly less than picking by hand which takes longer and can cost up to $750 per acre. Artisan Pinot Noir producers in are not generally enamored with machine harvesting because it removes the ability to do more precise harvesting including leaving second crop behind and avoiding bunches with rot or mold. In addition, Pinot Noir demands gentle handling and minimal contact with air. Some Pinot Noir producers have experimented with machine harvesting and found it suitable when the vineyard is set up properly for it. ** The glassy-winged sharpshooter, vine mealybug and the light brown apple moth continue to be a concern in California although these pests have drawn little press of late. Controlling the glassy-winged sharpshooter, which carries Pierce’s Disease, has cost California more than $25 million a year but eradication has been successful. In Temecula, for instance, the area now has more vineyard acreage planted than it did before 1999 when nearly half of the vineyards were lost to Pierce’s Disease. Leafroll virus appears to be spreading rapidly. 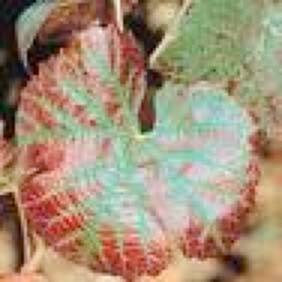 Visitors to wine regions have most certainly seen the signs of leafroll virus: a reddening and rolling under of the leaf margins on leaves in some vineyards. The result is poor maturation of grapes. Leafroll virus is spread by the grape and obscure mealybug and possibly by other vectors. Control and possible eradication depends on impeccably clean plant material from nurseries and avoidance of spread and contamination from vineyards already affected. ** More Pinot Noir producers are using three, four and even five-year aged barrels. Increasing the length of stave seasoning can raise the cost of barrels to $1,400, but some winemakers feel the added cost is justified by the more refined and gentle oak character that is added to the Pinot Noir. Tonnellerie Radoux™ announced in December the Radoux OakScan, a system that rapidly analyzes and classifies the oak staves used to make barrels. The new tool uses infrared spectrometry to instantly quantify extractable tannins (ellagitannins) in individual oak staves before they enter production. Extractable tannins have a profound effect on the aromas and flavors of the wine they contact,and the Radoux OakScan™ enables customers to understand the potential tannic contribution of finished barrels. ** Barrel alternatives are becoming more popular with winemakers. Oak adjuncts include oak chips, blocks and powders, replacement of oak staves in used barrels or addition of oak staves to stainless steel tanks, oak products inserted into neutral barrels, and shaving and re-toasting the interior of used barrels. Most winemakers will still not talk about the use of oak alternatives for fear of creating a perception of inferior quality in their wines. The biggest challenge in using oak additives is avoiding over-oaking the wine. 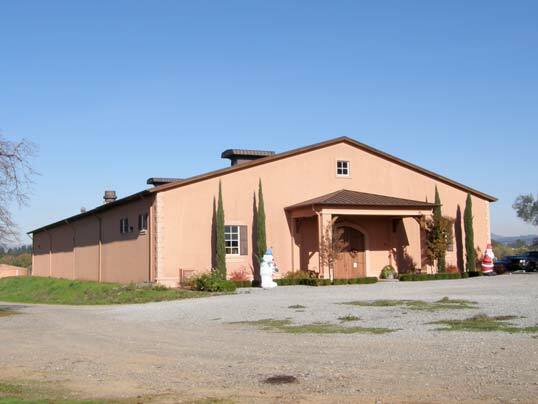 ** Warehouse winery complexes are practical and popular. In stark contrast to many of the lush wine country estates that dot the landscape of noted wine regions, the practical and functional spaces in warehouse complexes lack the visual impact and romantic appeal of wine but provide a number of advantages to small producers. Examples abound including the “Lompoc Wine Ghetto” in the Santa Rita Hills and a facility just south of downtown Sonoma that opened in 2008. Small producers are able to save money by renting space and using it to buy the best fruit and equipment. As Steve MacRostie, a tenant of the new winery warehouse complex in Sonoma, said in the Sonoma Valley Sun (March 27, 2008), “We approached our winery as an artisan’s workshop, not a work of art in and of itself.” Some developers are now building facilities specifically for housing wineries. An added advantage of the warehouse complex arrangement is that the proximity of several wineries allows the sharing of information and advice as well as equipment. ** Wine enthusiasts clamor to make their own wine. Crushpad, a 34,000 square foot facility located in San Francisco, is one of the first urban wineries to offer the commoner with no wine making experience the chance to craft his own wine in small lots with a manageable financial investment. Crushpad now allows their customers to receive real-time streaming video to direct the action from the comfort of their home. Crushpad’s Wine Styler is an online tool that enables individuals to graphically define the style of their wine and automatically drive the associated technical wine making decisions. Crushpad now has over 5,000 clients including wine enthusiasts, professional winemakers, sommeliers, wine bars, retailers and restaurateurs. Grapes are sourced from California, Oregon and Washington. Visit www.cruspadwine.com. ** The remarkable surging German Pinot Noir industry. Germany has quietly become the world’s third largest producer of Pinot Noir, behind France and the United States. Germany now has roughly 250,000 acres of vines, with Pinot Noir (called Spätburgunder in Germany) accounting for 30,000 acres, and soon to be second only to Riesling in planted acreage in Germany. Many of the best examples of German Pinot Noir are not exported to the United States, so America’s exposure to Spätburgunder has been limited to lesser quality bottlings. The result is a perception of inferior quality. Look for this to change in the future. One of Germany’s greatest producers of Riesling, Dr. Ernst Loosen, is becoming more involved with Pinot Noir. He has made Pinot Noir since 1996 at his J.K. Wolf Winery and has now joined in a partnership with Oregon winemaker Jay Somers of J. Christopher to produce Pinot Noir in this country. ** Sheep have been helpful in providing vineyard maintenance for some time and now bulls are making an appearance in the Alexander Valley of California. 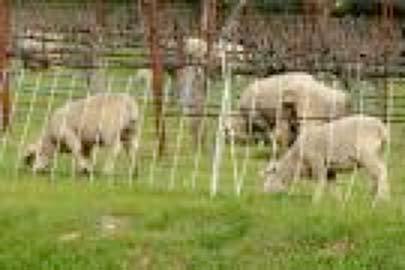 Sheep and bulls keep weeds in the vineyard down and since they forage for different vegetation, the combination of the two is very effective. The bulls being used are only 60% the size of normal cattle. Sheep and bulls have to be removed during the growing season. The challenge is training the bulls to forage between the vineyard rows without damaging the vine trellising system. ** NASA has a tool to analyze wine. The Mars Organic Analyzer (MOA) is part of a life-detection system that will be sent on an expedition to Mars in 2013. The MOA looks primarily for nitrogen-based compounds known as amines which are in various forms throughout life’s cells. University California Berkeley Professor of Chemistry, Richard Mathies, invented the MOA. As a wine drinker, he would have a glass or two of red wine with dinner and then wake up in the early morning hours, hot, flushed and displaying a rapid pulse and heightened blood pressure. The physiological response was due to the release of adrenaline caused by tyramine which stimulates adrenaline production. Tyramine is common in foods made with bacterial fermentation such as wine, cheese and aged meats. 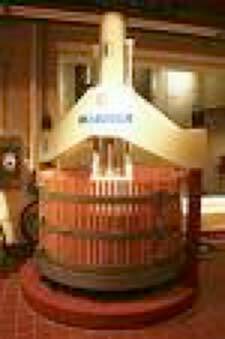 Mathies studied winemaking to determine when in the process tyramine is produced, and found it was created during secondary or malolactic fermentation which is driven by bacteria. Malolactic fermentation creates both tyramines and histamines, both of which can cause a reaction in some people. Studies are pending to determine which red wines are highest in tyramines. It would be helpful to sensitive consumers to know which wines of any type are lowest in tyramines and histamines. For now, sensitive consumers should look for wines that have not undergone malolactic fermentation. ** Wine label proposals create a stir. Federal regulators are considering requiring all alcoholic beverages to have both nutrition and alcohol-content displayed on labels. The TTB would mandate that labels duplicate food labels in displaying how many carbohydrates and calories and the amounts of protein and fat alcoholic drinks contain. In addition, the proposal makes inclusion of the amount of alcohol in fluid ounces in a drink and the statement, “A standard drink contains 0.6 fluid ounces of alcohol” optional. The alcohol-by-volume could still be listed anywhere on the container as it is now. Vintners are generally opposed to the proposed regulations as every wine would have to be lab tested and labels on wine bottles leave little room to include all the nutrition facts. A decision by the TTB was supposed to be forthcoming by the end of the year but no ruling had been released. Bonny Doon Vineyards began listing winemaking ingredients on the back of some labels in 2008. Confusing all but the most knowledgeable consumers, he lists the ingredients in his Ca’ Del Solo Albarino as biodynamic grapes, sulfur dioxide, indigenous yeast, organic yeast hulls and betonite. In a related issue with relevance to labeling, the term “old-vine” is creating new debate in the wine industry. Most winemakers believe the terminology should be defined and regulated according to Wines & Vines (February 6, 2008). Some choose to define “old-vine” as a minimum of 20 years and others prefer 50 years as a minimum. There are also disagreements about the percentage of grapes that should be required in a wine labeled “old-vine.” Some winemakers would agree that “old-vine” grapes should make up at least 85% of the grapes contained in a wine sold as “old-vine,” and others demand that 95% of the grapes be from “old-vine” sources. There are variances to consider among different varietals as well. For example, Pinot Noir vineyards over 20 years are considered old, yet Zinfandel from a 20 year-old vineyard would not be labeled “old-vine.” The issue of “old-vines” results from the perception by many consumers who consider “old-vine” wines better, although industry veterans dispute the validity of this claim. ** China is becoming a major wine producing and wine consuming nation. China’s government promotes wine as good for health and as a result, the populace eagerly consumes all the wine produced in that country. China is now the sixth largest wine-producing country in the world. With European advisors and investment, the latest equipment and quality grape sources, the Chinese are gradually producing more desirable wines. ** Wine blogs continue to grow and develop a loyal consumer following. 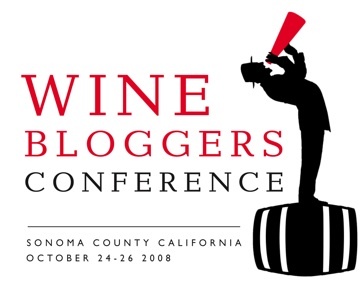 Over 400 wine blogs exist today and both a North American and European Wine Bloggers Conference was held in 2008. Wine enthusiasts love the opportunity to comment and argue about wine and blogs provide the perfect outlet. Very little income is forthcoming from advertising for wine blogs but that has not discouraged wine blog creators. Wineries themselves often have a blog aimed at creating added interest in their wine personnel and production. Tom Wark, who writes his own blog, Fermentation: The Daily Wine Blog, has created the American Wine Blog Awards to bring attention to the best blogs on the Web. Visit www.alawine.com to see a listing and a rating of the 100 top wine blogs compiled from wine search popularity data. ** New wine publication debuts in 2008. Sommelier Journal is directed at professionals in the restaurant business but the quality of the articles will appeal to all wine enthusiasts. I applaud the editors’ decision not to publish numerical scores. Subscriptions are $59 for twelve issues. 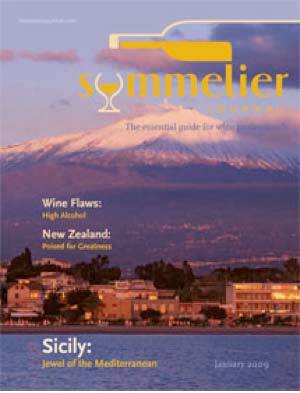 For more information or to subscribe, visit www.sommelierjournal.com. ** Wine Bars continue to increase in popularity. The newest New York City Zagat Survey lists 76 wine bars and some are showing up now even in hotel lobbies and airports. Wine bars can provide a relaxed place to learn about both wine and wine and food pairing and many young adults are drawn to them for their hip atmosphere and congeniality. ** Established high-quality Pinot Noir vineyards are being sold to new ownership both in California and Oregon. Seven Springs and Anden Vineyard in Oregon’s Willamette Valley were sold to a California winery partnership, The Evening Lands, which also acquired Occidental Vineyard on the Sonoma Coast. One of the oldest vineyards in Oregon, Hyland Vineyard in the McMinnville appellation, was acquired by partners Laurent Montalieu, Danielle Andrus-Montalieu of Solena Cellars along with John Niemeyer, a partner of the Montalieus in the NW Wine Company. These change of ownerships have left many long time recipients of grapes from these vineyards scrambling for new premium grape sources. ** Several pro-wine bills were signed into legislation in California in 2008. AB 2004 allows visitors to wineries to buy and consume wine on the premises. AB 2090 creates a temporary license for winery and grower associations to present tasting events to educate consumers and retailers about wine. AB 2293 allows wineries to distribute their wines (for free, if they choose) directly to consumers at invitation-only gatherings with a caterer’s permit. AB 3071 removes prohibitions against the presence of minors at wineries. SB 157 permits nonprofit groups to hold events where wine is sold in coordination with California wineries. Wine orders can be taken and custom crush producers can donate and pour wine. ** Anderson Valley on the move. Three new wineries, all with tasting rooms, are in the works in Anderson Valley. Goldeneye built a 12,000 case winery in Philo, Jim Ball Vineyard has a new winery now open across the street from Goldeneye’s tasting room on Highway 128 and Foursight Wines, owned by the Charles family who are long time growers in Anderson Valley, has launched their new label and are constructing a new facility southeast of downtown Boonville. In addition, Navarro Vineyards is rumored to have a new vineyard and winery south of Boonville in the planning stages. Don and Rhonda Carano bought the Lazy Creek Vineyard in Anderson Valley and plan to keep the label intact. The winemaker at Ferrari- Carano, Christy Griffith, will be the new winemaker at Lazy Creek Vineyard. ** In August, 2008, the TTB suspended approval of all AVA applications currently submitted and temporarily refused to accept any new ones. The TTB is considering possible revisions of the current AVA approval process. “It takes a little while to get the rhythm of some plants. It’s like kids, if you spend time with them, teach them things, then when they’re eighteen, they have a work ethic and are curious about life. They’ll do well for themselves. If you set them on the couch, give them Captain Crunch and kick them out at eighteen, they’ll fall on their face. Vines are the same way. They need to be brought up in the way you want them to act as adults. WINE is the work of André Dominé along with seventeen other writers and two photographers. This completely revised edition was published in hardcover by h.f.ullmann in 2008 ($49.95). WINE is a magnificent and comprehensive reference volume of considerable heft that includes 926 pages of text, color illustrations and photographs and detailed maps of every major wine producing region in the world. André Dominé is one of the first journalists to write about the wines of southern France and is an accomplished and experienced wine authority. He is to be commended for the scope of work displayed in this volume. The book’s price is a pittance considering the time and expertise required to organize and produce this book. For the price of a good bottle of Pinot Noir, you can have all the world’s wine regions instantly at your fingertips. The book is divided into three parts. Part One is titled History of Enjoying Wine and includes information on the smell and taste of wine, the aging and serving of wine with a review of glasses and corkscrews and a discussion of the types of wines. In Part Two, In the Vineyard & Winery, there are chapters devoted to grape varieties, soil, pruning, pests and diseases, the winemaking process and bottles and barrels. Part Three, Wines of the World, has individual chapters devoted to each of the world’s wine regions. A Glossary, Vintage Summary (years 1997 to 2007), extensive Index by subject, place, people, producers and estates, and a Bibliography complete the book. This is an extremely comprehensive volume of work on wine but in an attempt to be all-encompassing, much of the book's information is covered superficially. For example, only 36 pages are devoted to the wines of North America. Nevertheless, the book remains an invaluable reference volume. For example, one can find a listing of the 51 Grand Crus in Alsace, the appellations of Burgundy, Italian P.O.C.G. designations, Spanish wine law and quality pyramid, and such obscure information as the grape varieties of Portugal. No wine producing area of the world has been overlooked. For example, Luxembourg, England & Wales, Cypress, India, Turkey and Israel are included. Select notable producers from each country are profiled with color labels displayed for each producer. Many a reference book lacks enough appropriate maps for my taste, but WINE includes informative and detailed color maps of every country. Each map clearly delineates the location of the wine growing regions within each country. Because this volume is equal in weight to two bottles of Pinot Noir, it is not easily transportable and will find its rightful resting place in the home library along with other reference books on wine. There are multiple reference books on wine in the marketplace, some of which are written by accomplished wine writers and wine critics. This book surpasses many of them with its staggering scope of information and comprehensiveness. The Fourth Annual Celebration of Pigs & Pinot will be held March 20-21, 2009 at Hotel Healdsburg. The weekend offers a series of exciting events embracing Pinot Noir and pork, hosted by famed chef Charlie Palmer. The proceeds from the event benefit Share Our Strength® and The Healdsburg School. The event kicks off on Friday with Taste of Pigs & Pinot featuring a sampling of over 50 highly acclaimed Pinot Noirs from Sonoma County and around the world accompanied by a variety of pork dishes prepared by chefs Charlie Palmer and Les Goodman of Dry Creek Kitchen, Michael Mina of Michael Mina, and Christopher Kostow of The Restaurant at Meadowood. Saturday daytime seminars are followed in the evening by a Gala Dinner at the Dry Creek Kitchen paired with limited production Pinot Noirs. Pig & Pinot Packages for the entire event including accommodations at Hotel Healdsburg are available as well as a limited number of tickets to individual events. For information and tickets, consult www.hotelhealdsburg.com. 1. List any grape varieties added to your Pinot Noir wine on the label. Give us the full scoop. 2. Please make alcohol by volume percentage easily readable on labels. Many of your consumers are presbyopic. Also, designate case production on labels. 3. Provide copies of all of your labels on your website. These visual images help the consumer to connect and assist the wine press in spreading your image. 4. Disclose as much information as possible on your website. Pinot geeks clamor for it. Keep your site updated. 5. Stop promoting scores. There are so many wines awarded scores of 90 or above these days that lofty scores are meaningless and even laughable. 6. Winemakers please come out of your shells, enjoy the limelight and become more visible and vocal. Follow the lead of chefs. 7. Look to lower alcohol levels in finished wines so drinkers can consume moderately without becoming sideways and women can happily indulge. 8. Don’t over oak wines. It is true that no one is certain what Pinot Noir is supposed to taste like, but I seriously doubt that oak is high on the list. 9. Forget wax closures and heavy bottles. We are really interested most in what is in the bottle. 10. Discontinue reserve bottlings and make the single best wine from the vineyard(s) like Burgundians. 11. Consider crafting more blended wines which often offer more nuances and complexity. The truth is that many vineyards are not worthy of a vineyard-designate bottling. 12. Please no more gimmicky wines made from single Dijon clones. These wines usually disappoint as they invariably lack the whole package. 13. Include information about your wines (production, food matches, best window for drinking, etc.) and a personal note in wine shipments to consumers. 14. Avoid Styrofoam and embrace recyclable shipping containers and insulation.